Folks, I’m here today to talk with you about an endangered species: the clean sidewalk. Ever since the two disastrous storms this month, the clean sidewalk has been threatened drastically by sloth, corpulence, laziness and excuses. We need your help in restoring the habitat for the clean sidewalk today. If it were to go the way of the dodo bird, people would have to walk in the street. If it were to go the way of the passenger pigeon, DC’s residents would be in danger every day. So please, DC, save the sidewalks. Tell your friends and neighbors: it’s their duty to shovel off a path for people to walk. It’s not just a good idea, it’s the law. Save the sidewalks. Think of the children. Amen! We need that in Georgetown! All my sidewalks in my Arlington neighborhood are clean and dry, and they have been for several days. Around my area (Glover Park) sidewalks, and some parts of the streets are still covered in a slab of ice close to 2 inches deep and packed snow. The buses that usually run around that area, are now running on snow emergency routes because of this. It’s always the same people who never shovel their sidewalks. Can’t DC get their acts together and fine these people. It’s ridiculous. In addition, we need clean crosswalk ramps! What’s the point of all the sidewalks being clear when to cross the street you have to wade through a foot of snow? Someone has to be responsible for these areas too! I live on the 1300 block of Eastern Ave NE (Deanwood)and several of my neighbors in the middle of the block 1310 thru 1318 never clears their sidewalks. They do clear a direct path to their cars, therefore; I have to walk in the street of Eastern Ave which is a busy street. The above addressess are rental properties which usually consist of people who don’t give a darn about the property at all! I have call 311 each time and have become very agitated that nothing has been done! It’s days later and major streets in downtown DC are still not walkable. How sad is that? 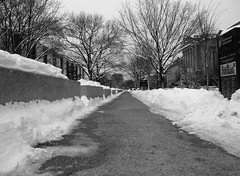 Major government buildings have feet of snow sitting there and are not walkable.